Contents: Buddha, Dharma, and the Lineage - Rig-pa - Relinquishing and Transforming our Defilements - Being in Space beyond Time - “I am shocked!” - Our Lifespan - The Four Categories of Enlightened Activities - A Few Words about Miracles - Renunciation - Bardo - A Breathing Practice - The Brilliant Light of Primordial Wisdom during the Bardo - Living in the World - Dedication and Long Life Prayers. We need to know that the Buddha did not invent Buddhism, rather he manifests the Dharma. Chös is the Tibetan term for Sanskrit Dharma and means ‘Teachings of the Buddha.’ How did Prince Siddhartha become Buddha? Because the Dharma was, is, and always will be present. According to the Buddha’s teachings, the Buddha of our historical times was the 7 th Buddha on Earth and Lord Maitreya, the next Buddha who was prophesied to become the 1000 th Buddha, will appear in about 2 million years. We can presume that 2 million years passed between Gautama Buddha and the previous Buddha, so it has been 140 million years since the first Buddha attained enlightenment on Earth. This means that the Dharma has been here for 140 millon years. But this can’t be right if we ask, how could the first Buddha have become Buddha? Lord Buddha tells us: “In the universe, the number ‘one’ is equal to the number of sand kernels in the Ganges River and the number ‘one’ is also sentient beings of that number who will attain Buddhahood.” If we are cynical, are very conservative and pessimistic, then in every moment, countless sentient beings in countless universes of endless space attain Buddhahood, therefore the Dharma is in Buddhism itself, is in Vajrayana itself. We have different lineages, Kagyü, Nyingma, Sakya, Gelug, etc. When it comes to Buddhism, the differences between the eight major lineages are just as insignificant as drinking water from a glass that is bigger than the smaller cup we have for yoghurt. We will get sick if we drink as much yoghurt as can be contained in the larger glass we use for water, so we have a smaller cup for yoghurt. We also have large plates for rice and smaller forks and larger spoons to eat solid food or to have soup. We use knives to cut our food into bite-sizes. The differences between the lineages of Vajrayana Buddhism are just as insignificant. There’s only a slight difference in the historical background of Buddhism in Tibet, which isn’t older than 2000 years. Vajrayana Buddhism was introduced to Tibet less than 2000 years ago, so the difference between lineages is irrelevant. On a larger scale, the difference between believers of Dharma and non-believers of Dharma is universal. Even if somebody who says, “I don’t believe in anything” does something that will cause him suffering, he will suffer; if he does something that will cause him happiness, he will be happy. A strong believer of Dharma will experience the same results if he acts in the same way as a non-believer. If a non-believer plants potatoes, he will end up with potatoes growing where he planted them and will not end up with rice. In the same way, if a serious devotee plants potatoes, he will also end up with potatoes and not with rice. So, there isn’t any difference between believers and non-believers, whereas it makes a big difference doing what is right or wrong. I can call myself a very serious Buddhist, but if I do wrong things, then wrong things will happen to me. And if somebody calls himself a non-believer and does right things, then right things will happen to him. So, what are the most important things? The most important things have to accord with bka’, ‘the rule of the truth.’ In the ultimate truth, there is no difference between anybody or between anything. In the relative truth, there are differences. Actions and intentions can be different; perceptions are different. And it isn’t the case that the Dharma is anything like, “The Dharma is for religion.” The Dharma has nothing to do with disharmony; the Dharma is for harmony. The Dharma has nothing to do with the causes of suffering; the Dharma is for happiness. The Dharma has nothing to do with developing ignorance; the Dharma is for developing wisdom. It’s not saying, “I’m a good Buddhist,” or “I’m a good Dharma practitioner,” or “I’m a good human being,” or “You’re a good sentient being.” Now I will speak about the Lineage. Why do we cherish the Holder of our Lineage, His Holiness the Gyalwa Karmapa, so much? It's because his blessing manifests from Buddha. And his blessing hasn’t been misinterpreted up to this day. It is given from person to person up to today. We cherish our Lineage-Holder. We don't want to lose him. That's all. Other than that, everything is the same. For example, to overcome the causes of suffering, namely, attachment, anger, jealousy, miserliness, and pride, we do Tummo (gtum-mo, the practice to develop inner heat to consume defilements and realize the inseparability of bliss and emptiness). That’s one method. Another method is giving up our personal concerns and affairs and doing everything helpful for other people, like bandaging their wounds if they are injured, feeding the hungry, giving the homeless shelter. We will reach the same destination as a practitioner by doing these things. Everything we do is to overcome the illusion that we have, which is due to not having realized the ultimate truth. What is our illusion? We take the relative truth to be the ultimate truth and continue doing so as long as we haven’t realized the ultimate truth. By taking the relative truth as the ultimate truth, anything that happens affects us. We become happy, we become upset, we become jealous, we are proud, and so forth. By helping others practically or by realizing our ultimate essence, which is the essence of everyone and everything, we relinquish the entirety of samsara, the source of suffering. I hope that the above eliminates the wrong idea that Buddhism is a dogma, or Buddhism is a kind of culture, or Buddhism is a kind of tradition. There is the law, there is culture, there is tradition, but the Lineage has a deeper meaning and we may not lose it. The Lineage, the tradition, the knowledge, and the wisdom are like four pillars of a beautiful hall. If we lose one of them, then three have to balance the hall. And if we lose two of them, then the beautiful building will definitely collapse and nothing will be left. When nothing is left, we have to rely on our own ignorance. Then we have to do research; then we can’t receive any transmissions, can't receive any teachings, can't receive any blessings, and we have to do everything ourselves. There is 99% chance, maybe more, that we will get it wrong. There is only 1% chance, maybe less, of getting it right, because the fruit is in the pudding. We’ve been in samsara for countless lifetimes and, even though we have received so much help, we’re still here. We all know what to expect if we have no help. I want to speak a little bit about rig-pa, the Tibetan term for ‘wisdom,’ i.e., the clear aspect of our mind that is devoid of ignorance and duality. Earlier, I spoke about the fact that the essence of everything and everyone is perfect and pure and that everyone is always and already a Buddha. But due to our ignorance, we are enslaved by our attachment, anger, jealously, ego pride, miserliness, and so forth; they keep us trapped in samsara (the Sanskrit term that connotes ‘the state of continually having to take birth under the control of ignorance and defilements and that is marked by suffering and anguish’). In which way are we ignorant, ma-rig-pa? We are ignorant because we haven’t realized our ultimate, primordial, limitless, incomparable, perfect essence. Ultimately, we are always and already pure, dag-pa. Relatively, we are ignorant and therefore impure, mi-dag-pa. It’s impossible to be impure ultimately, but we are tied down relatively due to our ignorance. We can become free of the strings that keep us tied down to samsara by entering the way of Dharma and treading the path. Treading the path of Dharma means doing our best to reach the destination. What is our destination, our goal? Our destination is realizing our intrinsic, pure essence. We tread the path by starting where we are. Everybody is somewhere else, because nobody is the same. Everybody has more or less of a specific defilement or a combination of a few or many of them, which they need to purify at their own pace, while others have attained more specific enlightened qualities. Since everybody is totally different, it’s impossible to find two people who have attained a same level of realization. At Buddhahood, everyone is non-differentiate. Until then, everybody is different. Not even twins look or are exactly alike. We start treading the path of Dharma from where we are, and - since everybody has the same primordial wisdom-essence - we reach the same destination as everybody who embarked on the journey and practiced the path. Let me say that, as Dharma practitioners, we shouldn’t try to accomplish anything for this life, because we made all preparations and already took care of this life in our past life and lives. It will definitely be bad for our next life if we do bad things in this life. Therefore, we should make preparations in this life for our next life by refraining from non-virtue and engaging in virtue. Furthermore, by focusing our attention on our next life, everything will naturally be taken care of in this life. I will explain this. It’s important not to only think that the sole purpose of this life is preparing for our next life but to know that the purpose of anything we do is enlightenment. If we focus our attention on enlightenment, then all our needs will naturally be taken care of. What is the need of samsara if we don’t have attachment, if we aren’t aggressive and angry, if we have no desires, if we aren’t jealous, if we are free of the basic defilements? When we are free of our defilements, samsara will be fulfilled. As it is, people try to fulfil their desires by working very hard to get what they want and to avoid and eliminate what they don’t want. Nothing is wrong with that, but it keeps them bound in samsara - that’s for sure. When people don’t like something, they fight about it and become entangled in more fighting. When people are jealous of others’ prosperity, they make things worse by doing something about it. Samsara weakens as the defilements decrease and it ends when the defilements are relinquished. Enlightenment is not exclusive but is all-inclusive in its unfathomable worth, so we should have all sentient beings in mind when we practice. We think, “I want to realize my pristine, intrinsic wisdom-essence so that I can help all sentient beings realize their pristine wisdom-essence, their rig-pa. And I want to be totally free of any limitation whatsoever so that I can help every living being become totally free, bröl-ba, of any limitation.” When we have achieved this goal, then everything occurs naturally. Jamgon Kongtrul Lodrö Thaye offered a very easy example in this section of The Rinchen Terdzö to illustrate how things occur naturally. The example: A farmer plants rice seeds to grow rice. The activity of planting the seeds refers to this life and the crop refers to the next life. Enlightenment is like that – it benefits all sentient beings. They will have rice and needn’t plant hay extra because it will naturally be there for them. If rice is grown, they will have lots of rice and hay. In the same way, when we focus on a greater cause, then other benefits happen naturally. Twenty-five years ago I thought that people were becoming more and more selfish and had less and less compassion and devotion. I thought that if somebody wanted to live in the mountains to meditate and reach Buddhahood - just like Buddha Shakyamuni, Guru Rinpoche, Jetsün Milarepa -, they couldn’t succeed because nobody would appreciate and support them. That’s what I thought 25 years ago. But when I look at the Dharma now, understand it better, practice more, and understand the life stories of the great masters who attained enlightenment, I see that a certain degree of degeneration has taken place. But I don’t think that spirits and nature have degenerated and that things will end. In the life story of the Buddha, we read that a monkey from the forest came to him and offered him honey. This makes me believe that if we only dedicate a little bit of something, then it won’t work for us. If, on the other hand, we are dedicated 100%, if we are totally devoted and compassionate, if we have a pure Lineage, and if we are determined, then we won’t die of starvation in a cave. I’m sure of that. I’m also sure that a bear or cobra won’t come and won’t bite and kill us. When the Buddha was meditating, a cobra came to shield him from the sun and rain. I’m sure this will happen to us, too, because we are in essence the same as the Buddha. What I think we are lacking is total commitment. The problem is that commitment of compassion as well as devotion are missing - they aren’t there. Without being totally dedicated and without having made preparations, of course, we’ll get into trouble if we go into the mountains just for the sake of giving it a try, waiting to see if a mountain spirit will feed us, or a monkey will bring us honey, or an elephant will bring us a coconut. If we merely give it a try and a monkey comes into our cave, it will run away real fast when he sees that nothing is there for him. If we have fruits, the monkey will attack us. But if we are totally pure, like the great masters, then it will be the same for us. I also think that human beings cannot lose their primordial goodness. A person can be very bad, but how bad can somebody really be? Evil has a limit; being bad has a limit. But there’s no limit to goodness; being good has no limit. In this way, the teachings that everything is spontaneous, everything is pure, and everything is primordial are very profound. The terms “spontaneous, pure, primordial” are very much Dzogchen and only differ slightly from the terms used in other traditions. In essence, their meaning isn’t different than other terms that are used to describe the same quality. I’m using these terms now because the language in The Rinchen Terdzö is pretty much based on the Nyingma Tradition. We call the five main defilements “five poisons,” ignorance being their source. The main defilements are attachment, aggression, ego pride, jealousy, and miserliness. How can they be eliminated? We can’t throw them away. We can’t throw ignorance away because it doesn’t truly exist. It’s impossible to throw something that has no true existence away. We might argue, “But we have the defilements; they are there. How come?” Because we have the five primordial, pristine wisdoms that we don’t realize. When we realize them, we will have transformed our main defilements. The entire practice of Dharma is to relinquish our five main defilements. For example, the Theravada Tradition of Buddhism, which is Hinayana, teaches disciples to avoid anything that stimulates and causes their defilements to increase. Therefore Hinayana followers take vows. For example, to overcome attachment, one vow is to keep one’s head and eyebrows shaved and to dress in the least appealing color. This is why the Buddha gave monks and nuns these rules. The purpose of the precepts is to cut the conditions that cause us to give rise to the defilements. Cutting the conditions makes them disappear. There are a large number of precepts that must be kept. In addition, having received instructions from a qualified teacher, followers of Hinayana engage in the practice of calm abiding, shamata in Sanskrit, and special insight meditation, vipassana. By becoming proficient in these practices, they overcome their defilements and become an Arhat, the Sanskrit term that was translated into Tibetan as dgra-bcom-pa, ‘Foe destroyer.’ An Arhat is someone who has overcome the defilements and therefore has perfected the Hinayana path. The Bodhisattva path consists of cultivating loving kindness and compassion, Bodhicitta. We dedicate our life totally to working for the benefit of all sentient beings by practicing to attain Buddhahood. Having become very proficient, a Bodhisattva totally dedicates his life to helping all living beings reach Buddhahood. Bodhisattvas eradicate their defilements by working for the benefit of all sentient beings. That’s how Bodhisattvas relinquish their defilements. In Tantrayana, which is synonymous with Vajrayana, disciples learn and practice to transform their defilements. For example, defilements are vanquished through the power of the blessings and through the strength of meditating a forceful deity. Let me illustrate this. The practice of Chöd (gcöd, which literally means ‘cutting’) commences by loudly saying or shouting the syllable PETH. In that moment, for a few seconds, a practitioner will be free of all defilements. Of course, depending upon an individual’s maturity, the defilements return after a longer or shorter period of time and are as they were before or are slightly weakened. They are weakened more and more each time we practice Chöd. In a mandala offering, not in the preliminary Ngöndro practice of making mandala offerings but in the Sambhogakaya mandala, the five Buddha families represent the manifestation of the five pristine wisdoms. The Dhyani Buddhas, rgyäl-ba-rigs-lnga, are the ‘Five Victorious Ones.’ As said, the five defilements prevail as long as the five pristine wisdoms haven’t been recognized and realized. Of course, we want to recognize and realize the five wisdoms, but this will remain wishful-thinking for most of us at this time. Yet, we can get a taste of the five wisdoms. It may sound difficult, but it isn’t. Looking at the transformation of ignorance, let us think of something we don’t know, and there’s a lot. We don’t even know how many things there are that we don’t know. Anybody who knows that he doesn’t know has good knowledge. Now we think of something that we know very well, and that is the transformation of ignorance. What is our name? We know our name and therefore aren’t ignorant of our name. What is our essence? We heard a little bit about our essence, not much, and what we don’t know is our ignorance. What about jealousy and ego pride? These days, jealousy and ego pride are a big problem in all human societies, therefore I can’t tell the limit of somebody’s pride and jealousy. I cannot say, because human beings are very, very confused. Especially their pride and jealousy manifest very clearly. Being Buddhists, I’m quite sure that nobody here is jealous of or feels ego pride with regard to Lord Buddha or Guru Rinpoche. I don’t think so. Therefore, appreciating and cherishing the Buddha and Guru Rinpoche are the transformation of our jealousy and pride. This has been a mere introduction to the transformation of our defilements into primordial, pristine wisdom. It’s kindergarten-level, but it’s the first step of a million-mile journey. The meaning is a million times deeper than what I’ve said here. But the first step of the million-mile journey is to pin-point and experience the absence of the defilements. We can do it that way. When did Noble Chenrezig (Lord of compassion), Noble Manjushri (Lord of the perfection of wisdom-awareness), Arya Tara (the female Bodhisattva of compassion), and Arya Sarasvati (Patron of arts and sciences) become what they are in space that is beyond time? Compassion and wisdom are primordial. They are the base of liberation, represented by the deities of time. But there is no time. Wisdom and compassion are primordial, therefore beyond time. The deities represent the primordial, pristine essence of everything - clarity and emptiness inseparable. There are five Dhyani Buddhas (‘Five Victorious Ones’) with their consorts. They aren’t ten persons but are the manifestation of the essence that accords with it. The five Dhyani Buddhas are: Vairochana, Akshobhya, Ratnasambhava, Amitabha, and Amoghasiddhi. Their five consorts are the pure form of the five elements; Mamaki (earth, consort of Ratnasambhava); Buddha Locana (water, consort of Akshobhya); Pandara Vasini (fire, consort of Amitabha); Samaya Tara (air, consort of Amoghasiddhi); and space Akasha Datishvari (space, consort of Vairochana). When we meditate the mandala of the Five Buddhas and their consorts, the front is the East, not the sun’s eastern direction. Since the East doesn’t really exist, it can never be found. Not relating to the Earth’s sun, if we go eastwards, everything will face east. If we go westwards, everything will face west. If we go northwest, everything will face northwest. If we go southwards, everything will face south. There’s no such thing as a real south, north, up, down, etc. They are like enlarged images under a microscope, are illusions, have no base, are mere imputations. When we are in front of the mandala, all deities are facing us. When we prostrate in the southern direction of the mandala, all deities are facing us. If someone else prostrates in the eastern direction of the mandala at the same time, everything faces us. When we meditate the central deity, then all other deities are facing us. When we meditate another deity, the central deity is facing us. If we are the deity residing in the south, the central deity is facing us. If we are the deity residing in the west, the central deity is facing us. If we are the deity residing in the east, the central deity is facing us. This doesn’t mean that all other Buddhas stand up and take their seat again facing east or that they stand up and sit down again facing west when we do. It isn’t like that. It’s ineffable, incomparable, but that is how the mind is, that is how the truth is. Truth has no limits. The mind’s essence has no limits because it is primordial wisdom. So, this is how we should understand that the essence of Dharma is primordial, which has nothing to do with history taking place in time. Ultimately, there’s no difference between past and future. Let me exemplify by asking, where is the center of space? Space has no end, therefore it has no center. Wherever we are is the center of space and, at the same time, it’s the end of space. For a being living billions of light years away from where we are, the center of space is where he is. At the same time, the end of space is where he is and where each one of us is at this moment in time. Maybe because I’m Tibetan and a little bit old-fashioned, I see how tantric mandalas are treated nowadays. Tibetans say that people who are old-fashioned have a green brain. But these days saying that somebody has a green brain is saying that he is modern and is an environmentalist. Why do Tibetans say that somebody who isn’t modern has a green brain? Because cheese turns green when it goes bad. One’s brain is very poor if one is old-fashioned and then it is green. Traditionally and according to the Lineage, we are not allowed to see the mandala until we have received the initiation into that specific mandala. For goodness sake, having them printed in a calendar or on a T-shirt and selling those items in a shop for anybody to buy for so-and-so-many Rupees is a scandal! Do you understand what I mean? But maybe I’m really old-fashioned, not up-to-date, and very behind. If that’s the case, I have a lot to catch up on! What is the cause of a short or long life? Karma accumulated in a past life as well as karma accumulated in this life. It’s reasonable and makes sense that saving many lives will lead to a longer life, whereas killing living beings will result in a shorter life. Another reason for living a shorter life is that we were born. Hadn’t we been born, we wouldn’t die, i.e., we are bound to die because we were born. Our lifespan depends upon many conditions. One of the most obvious is our eating habits. For example, if we have a luxurious life, eat lots of meat without potatoes and vegetables, drink, and don’t exercise, we will be fat, our circulation will not function properly, our heart and liver will be damaged and destroyed, and as a result our life will be short. If, in contrast, we have a luxurious life but are disciplined and ethical, then we have a better chance of living longer. Aggression is also a big cause for a short life. Being aggressive and not controlling our anger naturally lead to a short life. One obvious way of being aggressive is shouting at people, even for no reason. Doing the opposite is a way to have a long life. Receiving the transmission and blessing for a long life, repeating the long life mantra, and saving lives are ways to have a long life. Furthermore, utilizing the energy of air and space in our body enables us to eat less. But we would have to be able to master our energy-sources in our body, thus transforming our body that consists of coarse substances into ‘chi-med-do-rje-sku, an ‘immortal vajra-body.’ Our body can be transformed. Then it is like space, like the sky, and we will have attained ye-shes-kyi-tshe, ‘primordial, wisdom life.’ At that time, we will have reached the level of Guru Rinpoche, i.e., the deathless state. Of course, I’m not sure that any of us can reach the level of Guru Rinpoche, Padmasambhava, definitely not me. But I won’t be sad when I die because I know it isn’t the end, rather, a continuation. Saying OM MANI PEMA HUNG is like one life, and afterwards I can say another OM MANI PEMA HUNG. If I pronounced it correctly the first time, then I’ll be able to pronounce it better the next time. So, since I took birth naturally, it isn’t a problem for me to die naturally. But, of course, I want to live as long and as well as possible so that I can serve the Buddha and sentient beings. Everybody is free to think what they want to think. Of course, if we want to reach the deathless state, we’ll have to do much more than we are presently doing. First and foremost, we should engage in ethical conduct of body, speech, and mind. Everything that we think has to be balanced and harmonious. Everything that we say and do has to be proper and correct. Ethical conduct means that everything that we are and do accords with the truth. There are four categories of activities, läs-bzhi, that a very accomplished practitioner carries out for the benefit of sentient beings. They are: pacifying, enriching, magnetizing, and destroying. The first is the activity of pacifying obstacles, ignorance, and defilements. Enriching activity can only be achieved after having overcome selfishness and attachment. We are stingy because we think we are so poor. We stole things, therefore cheated, and as a result we are now poor. We overcome our attachment by being generous, considerate, and kind to others. Being free of attachment and defilements is being authentic and truthful. Then everything is like a treasure in the sky, i.e., we don’t want and don’t need anything anymore and live from the energy of space, which is the same as being immortal and having everything. So, that’s what enriching activity is like. Magnetizing activity is the ability to make people listen to us and respect us. It’s genuine when we have pure dedication and compassion. We never saw or heard Buddha Shakayamuni in person, maybe from time to time he appeared to us in a dream. Prince Siddhartha became the Buddha due to his great dedication and pure compassion, which are the same as trusting that all sentient beings can attain enlightenment and helping them. When we think of the Buddha and take refuge in him, our anger and sorrow are overcome. For example, when we enter a shrine room of the Buddha, kneel down, and sincerely pray to him, all our burdens are gone, but they come back after we left. I think we have a special feeling when we put our bags aside and take off our shoes before entering a shrine room of the Buddha and thus we feel light and at ease while inside. We feel heavy again when we pick up our bags and put our shoes on after having left. I think this is the difference between auspicious and less auspicious synchronicity. In any case, we hope to one day be able to feel that we are always in the presence of the Buddha. Actually, Buddha is within us all the time. Our essence, our Buddha nature, our primordial wisdom is Buddha. If we are selfish and try to misuse the power of magnetizing others, for instance, by holding a sword in our hand and chasing after them, they will be frightened and will run away. Some people might even throw a rock at our head and then we’ll be under their power or maybe even be finished. It’s impossible to engage in magnetizing activity by giving people money. It won’t work. If we give somebody we want to attract 100$ one day, he’ll expect us to give him 100$ the next day and will be very upset if we don’t. In fact, he might even expect us to give him 1000$ the following day and will most likely expect more and more as time proceeds. That person might even threaten to make our behaviour known to others if we don’t give him more. Having learned about this, other people will think that we are trying to buy people and will lose respect for us. So, that won’t work. Genuine respect comes from genuine devotion and dedication. Buddha Shakyamuni, Guru Rinpoche, and Jetsün Milarepa are perfect examples of what it means to have genuine devotion and dedication. We never saw them, never talked to them, don’t have their addresses, phone numbers, or email connections. We have nothing, but we have pure devotion for them. They solve all our problems when we just think of them, and that is what magnetizing activity is like. I was told about a Lama who once lived in the area where I was born. His name was Lama White Bird. There is a big bird living in the Himalayas that is known as “white bird.” It has a white head and body, a black tail, and a red crown. This Lama meditated in the mountains and, because he didn’t care about things like that, he hardly wore any clothes, not even during the cold winter months. One white bird came to him, sat on him, and warmed him with its feathers. When devotees visited him to pay respect, it flew away and returned again after the people had left. This showed that because of his pure Bodhicitta, this Lama’s magnetizing activity was so powerful that he even attracted animals. I fully believe that this has nothing to do with the times, but that this can happen nowadays, too. If we are practitioners like this Lama and meditate in a tropical forest, for example, then tigers and crocodiles will protect and help us. I totally believe this. But I wouldn’t dare try, because I have to be 100% pure, just like Jestün Milarepa. I don’t think it would be wise to give it a try because we might end up in our next life. Then the people who love us will only find our body in bits and pieces. Destroying activity is also only authentic if we have pure dedication and compassion. We will be able to vanquish and destroy all problems if we have pure dedication and compassion. Let me tell a true story: Angulimala was a serial killer, a mass murderer. He even tried to kill the Buddha, but he couldn’t. Because of the Buddha’s compassion, he became a disciple and attained the state of an Arhat. Angulimala didn’t become an Arhat because the Buddha beat him up, otherwise he would have schemed to take revenge when he recovered from the beating. Destroying activity means having pure compassion and being able to tame someone just as evil, cruel, and untamed as Angulimala was before he became a close disciple of the Buddha. We have to be free of aggression, anger, attachment, and ego in order to be able to benefit others when engaging in destroying activity, otherwise it will destroy us. In this way, enriching, magnetizing, and destroying activities will not work as long as we are selfish and aggressive and as long as we have attachment and the other defilements. Ultimately, there is no difference between outer objects and our inner mind, and that’s why there are miracles. Most people don’t want to think about miracles these days. Why? In any case, it’s a pity. People dismiss miracles due to their big ego, but they are willing to pay a high entrance fee to see a magic show. Magic and miracles are totally different. Lord Buddha did not perform magic when he manifested in many different ways. Guru Rinpoche did not engage in magic when he manifested many different things. Jetsün Milarepa did not perform magic when he flew through the sky like a bird. Their activities were miracles. How is this? Realization isn’t realization of one single topic, rather, realization is realization of everything. A Buddha is not limited or restricted in any way. The enlightened activities of Buddhahood are limitless because enlightenment is being enlightenment about everything. That is why enlightened masters can perform miracles. We all have attachment of some kind, of course, but we don’t have neurotic attachment. If somebody is neurotically attached to samsara, to family members and various things, then he won’t be able to let go of them when he dies. The only way to become free of the obstacles that keep us entangled in samsara is to practice becoming free of these obstacles before we die. We need to clearly and sincerely understand and realize that all things in our life, of our past lives, and of our future lives are like illusions in a dream. If we fully understand and realize this, then we won’t have any problems. As long as we take things to be real, we will be attached to them and thus they will continue keeping us bound in samsara. Often people have negative ideas when we speak about renunciation. They think it means denying life, turning our back on the world, abandoning everything, and taking on no responsibilities. This is not what renunciation means. In Buddhism, renunciation means knowing that everything is nothing more and nothing less than an illusion. Nevertheless, even though everything is illusory, nobody wants their illusions to be unpleasant, because every living being wants to be happy and wants to avoid discomfort and mental and physical anguish and pain. In one text it is mentioned that children cry when the sand castle they built crumbles and falls. In the same way, every large or small thing, every big or little problem, is like a sand castle that children build in the dunes or in the sandbox of a playground. They are so happy and joyful when their sand castle is beautiful and cry when it collapses. In samsara, the same thing happens again and again and all the time. Knowing and realizing that everything is impermanent and illusory is the key we hold in our hands to have pure and genuine renunciation, spang-ba. Renunciation doesn’t mean becoming unsocial, in which case we would only be exchanging one mask for another mask. Whether we are social or unsocial, in one way or another we are in samsara. Actually, being unsocial is being more deeply entrenched in samsara; it’s what we can call “negative samsara.” Being social is being less entrenched in samara; it’s what we can call “positive samsara” and means being in harmony. But, renunciation doesn’t mean being social or unsocial, rather, it means recognizing the truth, i.e., knowing that all things are deceptive and a fallacy. Having this knowledge doesn’t mean having neurotic attachment, neurotic anger, neurotic jealousy, or neurotic pride. Renunciation means being free of attachment to all persons and things. I don’t know what the English word “renunciation” exactly means because I’m not a linguist, but it does imply ‘going against.’ In the context of Buddhism, renunciation means ‘going for it.’ In this way, a good practitioner holds renunciation like he holds a key in his hands. We have to have renunciation right away, starting today. It won’t be given to us when we are forced to part from things we are attached to. We have to have renunciation right now. Even though we still have attachment and defilements, knowing that the relative truth is not the ultimate truth makes it easy to renounce samsara. We have to recognize that the relative truth is the relative truth and the ultimate truth is the ultimate truth. By knowing that a dream is a dream while dreaming, we aren’t attached to an attractive image that we perceive in our dream. There’s no reason we shouldn’t enjoy the beautiful sand castle as long as it is there, but if we know that it’s just like an image in a dream, we have no problem and aren’t sad when it collapses. Knowing that everything is just as illusory as an appearance in a dream, then – as long as we have mindfulness and awareness – there’s nothing wrong with living a comfortable and nice life. Yet, being a nice person who doesn’t create bad karma isn’t enlightenment. We must have pure renunciation and be like the Buddha, Guru Rinpoche, and Jetsün Milarepa in order to achieve perfect enlightenment in this very life. I have mentioned that our mind is primordial, ineffable, incomparable, and not divided into subject and object. But, how did our dualistic fixation become so strongly implanted in our body that consists of blood and bones? How did this happen? Our mind consists of consciousnesses due to our karma. From among the five elements (earth, water, fire, air, and space), our mind is primarily and most closely connected with air, rlung in Tibetan, which means ‘wind.’ Receiving the blessings of Dharma by means of this wind is the reason we hoist prayer flags on high passes or on rooftops. Wind blows through them, thus bringing whatever blessings are printed on them to everyone who breathes in the energy-wind. That is the purpose and significance of prayer flags. Now, even when there’s no wind, we do react when something moves and flows. For example, you are happy when I say something nice, upset when I say something bad, and laugh when I say something funny. All of this is due to the power of rlung, ‘energy-wind,’ so our mind mixes and mingles with space because of our flowing energy-wind. Then our energy-wind becomes cohesive through the energy-force of water, and our mind becomes warm through the energy-force of fire. After 29 days, our mind, which was conceived in the fluidity of water, becomes solid and a channel develops from this solidity and spreads, forming our body. Ten stages, referred to as “ten incarnations,” evolve until we are born. The ten incarnations are forms that resemble a fish, then a turtle, etc. This is how our body and mind are connected and develop. Why do we think that the Bardo (‘the intermediate state after death’) is so frightening? It needn’t be frightening, but it is if we don’t know what is going on. For example, we are frightened when we dream of being chased by 100 elephants, but if we know that we are dreaming, we will just let the elephants pass by and nothing will happen. In the same way, by failing to recognize and to know that we are in the Bardo when we are, we are frightened of the manifestations that appear to us during that time. Right now we aren’t afraid. Why? Because our sensory consciousnesses and our body are limited, so everything we perceive is limited. We don’t see what we don’t see. If we don’t want to see something, we just close our eyes and then we don’t see it. If we don’t want to hear something, we just wear earplugs and don’t hear what we don’t want to hear. If we don’t want to go somewhere, we just don’t go. But, it’s not like that in Bardo, because we don’t have a body and sensory organs then. In Bardo, we are free of relative freedom. It isn’t enlightenment, but it’s very close to enlightenment. This is why we consider Bardo a very important time for a deceased person. It’s a great chance to attain enlightenment. Why, then, is Bardo frightening? Because we see everything, we hear everything, and we immediately are any place that we think of. So, we have no control whatsoever, i.e., we have no choice. If we are thrown out of an airplane from 30.000 ft. without a parachute, we fall, right? We don’t want to fall, but in the Bardo it’s useless saying, “I don’t want to fall.” We just fall and fall, faster and faster. It’s like that in the Bardo. Everything happens like that, and we can’t close our eyes. Should we know that we are in the Bardo, it would be a great opportunity to attain enlightenment. We are in this body now, so breathing practices are extremely important. I will explain one of the three practices that Jamgon Kongtrul Lodrö Thaye described in The Rinchen Terdzö here. Four phases take place when we breathe. They are: we breathe out, hold still a moment, breathe in, hold still a moment. We have been breathing ever since we were an embryo, then a foetus, when we were born, and then through all our life. We use our breathing as a practice. It’s a very traditional practice in our Lineage to breathe out from both our nose and mouth as smoothly as possible and to pause a little while afterwards. Then we breathe in as smoothly as possible and pause for a short while. Then we breathe out again in the same way. We keep our breathing open while we pause a short while, not putting an end to our breathing but just keeping everything open. After having practiced some time, the flow of our breathing will be natural and in complete harmony with our body and mind. As a result, the five elements of our body become balanced and we feel physically comfortable and mentally fresh. It’s okay falling asleep while doing this practice. I’m happy when meditators fall asleep while practicing this, because it means they won’t go crazy. People who meditate should calm down. If they become more jumpy from doing this practice, they will go crazy. I worry very much and tell meditators who are jumpy to either meditate correctly or to stop meditating. If anybody has extra time, he can repeat the mantra of Noble Chenrezig, OM MANI PEMA HUNG, or recite prayers, instead of gossiping and chattering. As to the breathing practice, there are many trees around Sherab Ling Monastery and you can sit under one of them, of course, the tree is not in front of you but behind you. Then the practice is very pleasant and good for your body and mind. This practice should not be a struggle. Of course, at the beginning one has to put a little bit of effort into it, but not too much. You can become used to it after about ½-an-hour and then it becomes naturally smooth. The first 5 or 10 minutes might be difficult and you might want to stop because up to now you as well as most of us have used your breath in a wrong way. How? Many people have the habit of breathing in and holding their breath for a long time, to the point of exploding; these people are humorous but often depressed. Many people have the habit of breathing out slowly, pausing for a long time before they inhale, and immediately exhaling again after they breathed in; they have little energy, are usually not efficient, become tired very easily, are quickly upset in a sort of self-torturing way. These are the two ways people become upset. Extroverts shout and introverts cry. Of course, the effects of the breathing practice I just explained vary from person to person, but balancing breathing correctly balances the whole person. As a result, we are healthier and in a better spirit. I thought it would be helpful to share this practice with you. It doesn’t take millions of years to light up a room that has been dark for millions of years. If we enter that dark room with a lit torch, the room will immediately light up. In the same way, our ignorance is like the dark room and our primordial, pristine wisdom is the embodiment of brilliant light, but it is much more than that. After Buddha Shakyamuni attained enlightenment, regardless of whether they were believers and followers or not, everybody saw him surrounded by a brilliant and bright light. This brilliant light was the embodiment of primordial wisdom, the purified and transformed aspect of ignorance and of all defilements. When they saw Lord Buddha, the brilliant light manifested to all ordinary beings who perceive duality, just like we perceive light. There is a very sad story that I want to tell you. A monk called Lekarma followed the Buddha, but he had no devotion for the Buddha. At the end of his life, he told the Buddha, “I have no devotion for you and don’t want to have anything to do with you. I saw nothing good about you other than that there was a bright light around you.” Lekarma died and was reborn as a hungry ghost. Ordinary people can’t see hungry ghosts, in any case, I’ve never seen one and think that you haven’t either. Actually, I’m not looking forward to seeing one. Anyway, the Buddha blessed his monks so that they could see Lekarma in his existence as a pitiful hungry ghost. The Buddha tried to bless Lekarma, but he turned his back and went to the other side when the Buddha tried to approach him. When the Buddha tried to approach him there, he went to the other side again, so there was no way that the Buddha could bless him. This was due to Lekarma’s lack of devotion. He couldn’t connect with the Buddha’s compassion at that time in his life. But this doesn’t mean forever. Even Lekarma will see light when he is ready. Now, for example, my students want to see me encircled by light, so I have to behave, dress properly, sit on an elaborate wooden throne that is decorated with lots of gold leaf, brocade, and all these things. There’s no need for these things if there’s no light, right? Students want to see the Dharma glorified because of light, so I don’t think that they want to glorify me personally. They want to glorify the Dharma, which I embody. That’s why they are doing their best to make everything nice. As far as I’m concerned, I’m sitting on a big wooden box that was made by Norbu Lingka. It’s comfortable. Actually, I can even take a nap on it. That’s how big it is. When we die and are in the Bardo, we see and hear everything. We become terribly frightened of the bright and unrestricted appearance of the brilliant light at that time and therefore search for a place to hide. We find a dark and dim light and hide there. That dim light, which is a hiding-place for us, is the shadow of one of the five or six brilliant lights of primordial wisdom. For example, Noble Chenrezig’s mantra, OM MANI PEMA HUNG, consists of six syllables. When meditating the elaborate practice of Chenrezig, we visualize each syllable in a different color. For example, the bright white light of the syllable OM is the realm of the gods; the bright yellow light of NI is the realm of human beings. Each syllable has a different color that corresponds with the transformation of one of the six realms of samsara. The six realms of conditioned existence are: the realm of the gods, the realm of the jealous gods, the realm of human beings, the animal realm, the hungry ghost realm, and the hell realm. While in the Bardo, the light that corresponds with our karma becomes very, very bright. When the light of our next existence becomes unbearably bright, we run away from it and seek refuge in a dim light that also appears to us. We go deeper and deeper into that dim place of refuge, until it becomes very dark. In this point, we become unconscious, and that is the moment we are conceived as a human being or as a being of the realm of existence where we will take birth. As a practitioner of Bardo, if possible we should recognize the brilliant and bright light that appears to us as the crystal-clear light of wisdom. Instead of being afraid and fleeing, we enter into that light. Then we become the light that we embraced and attain realization of that specific Dhyani Buddha that I spoke about earlier. Tibetans folks don’t know much about philosophy. But I know that they say, “You should pray and know the deities so that you are able to recognize them when you die. If you don’t and are afraid of them, you will run away.” It’s very common for older Tibetans to say this, and it has a great meaning. It might sound like superstition, but it’s not. It has a great meaning, because we have the manifestation of all Buddhas and deities within us. For instance, we are afraid when the 100 peaceful and wrathful deities manifest to us in the Bardo, which means we are afraid of ourselves. When we run away from them, it’s as though we are trying to run away from our own shadow. We can run until we fall over, but we can never run away from our shadow, which is there as long as there is light. Some people tell me that the deities look like Tibetans and ask me, “Why do they manifest to me like that?” I try to be polite to these people who aren’t Tibetan and respond, “Have you ever seen a Tibetan having the head of a tiger? I haven’t. Have you ever seen a Tibetan dressed the way the forceful deities are dressed? I haven’t. Have you ever seen Tibetans surrounded by blazing flames? I haven’t.” That’s what I tell people who ask why the deities would only appear to be Tibetan. The appearances of the deities have nothing to do with Tibetan, oriental, or occidental cultures. They have nothing to do with the north, the south, the east, or the west. When somebody from the Orient sees a snake, he sees a snake. When somebody from the West sees a snake, he sees a snake. People from the north and people from the south see a snake when they do and don’t see something else. Everybody who sees a snake sees a snake and doesn’t see a bird. In the Bardo, the deities will manifest to us exactly and precisely the way they are, and they will manifest just like they are because they are the crystal-clear manifestations of our primordial wisdom that is primordial wisdom. If we are afraid and run away, we will be born in the specific realm of existence that is opposed to that deity of realization. But if we recognize and embrace the brilliant light of wisdom that manifests to us in a specific color and way while we are in the Bardo, then we will become enlightened. Due to having become united with the specific deity we embraced, we will become the deity that we recognized and realized. It’s very simple. We are able to comprehend the precious teachings. It’s very fortunate for us that we can comprehend them. For example, I can comprehend Mahamudra, Maha Ati, and the great philosophy of Madhyamika. I can comprehend all of them, and this is very fortunate for me. You can comprehend them, too, so that’s very fortunate for you. But it doesn’t mean much, because there is a risk that I want to bring forward. Being able to understand and comprehend is one thing, but becoming what we have understood by realizing it is another thing. We will be able to have tiny experiences and some of them might be interesting, but, since that deep understanding doesn’t take us far, we have to reach the level of realization. The risk we are all subject to is getting carried away by our experiences, and then our defilements will not be relinquished. We will remain dualistic and as a result everything we do will be karma. Therefore, no matter how high our understanding and our experiences might be, we still have to do our best to be correct. We have to do our best mentally, verbally, and physically. I’m only saying that I’ve been doing my best because of the blessings of my great masters. So I’m not afraid of my next life, but I’m very much afraid for this life. When I look up into the sky, it is filled with dark and stormy clouds and with lightning. When I look down, there are tens of thousands of crocodiles and wild beasts waiting to catch and eat me up. I feel like I am perched on a cliff, between all of these life-endangering threats. Above me the lightning strikes and I fear I will fall into the abyss below and be eaten bit by bit. What I want to say is that this is not a very comfortable world that we now live in. The most important thing is to feel in our heart that we are honest, trustful, and honourable. Our most important security while in this world is doing our best and having compassion and devotion. Actually, I want to have two wings that prevent me from being sucked up by a tornado and that keep me from falling into the abyss below. I want to have two vajra wings. The one vajra wing is wisdom and devotion. The other vajra wing is compassion, uprightness, truthfulness. I’m not saying that I have these and I’m not bragging when I say that I’m trying my best. I just want to say that if we try having the two vajra wings, then our understanding and meditative experiences will be wonderful. Everything will be okay in our life and in all lives to come. Thank you very much. 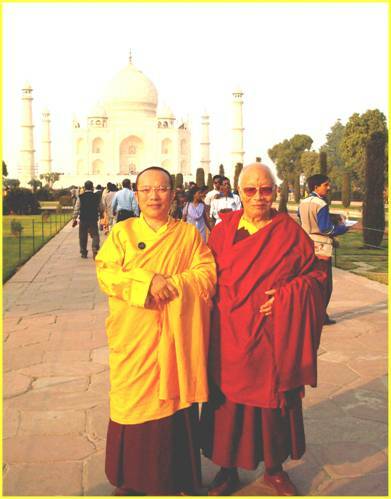 The original transcript of His Eminence Tai Situ Rinpoche’s teachings was transcribed at Palpung Sherab Ling and sent to the editor in 2007 by Zhyisil Chökyi Ghatsäl Charitable Trust, Auckland, New Zealand, with the request to edit the books entitled “Nectar of Dharma” by Khentin Tai Situpa. This article contains teachings that were presented on October 12, 14, 17-20, 22, 23, 25, 2006. They were edited and arranged for the Dharma Download Project of Khenpo Karma Namgyal at Karma Lekshey Ling Monastery in Nepal by Gaby Hollmann, responsible for all mistakes. 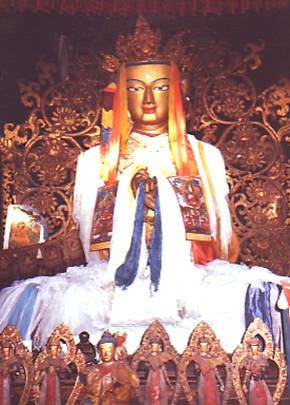 Photo of Buddha Vairochana in the Kumbum of Gyantse taken in 1986 by Gaby Hollmann. 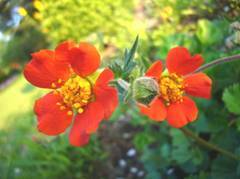 Photo of beautiful Icelandic poppies taken and kindly offered by Josef Kerklau of Münster. All persons and organizations mentioned here have copyright for their contribution. This article is made available for personal use only and may not be reproduced in any form or published. Munich, 2009.